If conditions are ideal, mature adults will emerge from the cacoon within 7-14 days, but in adverse conditions this is known to take up to a year. Sensing vibration, heat and carbon dioxide they emerge ready to feed on any near by warm blooded source. The common Flea prefers a warm, humid environment where dust and debris accumulate. They thrive underneath buildings and in yards frequented by animals. 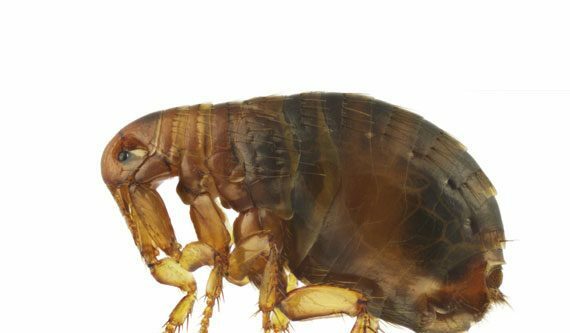 The soft furnishing and pet bedding in a household or work place are more of a luxury style accommodation to a flea infestation. The most effective ‘non chemical’ flea control is daily vacuuming fo all the hard to reach places including sofas, beds, mattresses, cushions, curtains and doormats. Used in conjunction with proper topical controls, vacuuming will help to reduces fleas and eggs in the environment. Special attention should also be paid to any and all animal bedding, which should be washed in bleach and aired to dry regularly. Flea’s have no wings and are quite small. Their size ranges from 2-4mm inn length. They are also dark in colour with a narrow body and long legs which they use to jump up to 20cm vertically and 40cm horizontally. • Thoroughly vacuum all carpeted areas, concentrating under all furniture, especially high-pressure areas where infestation is heavy. • Vacuum all soft furniture focusing on hard to reach cracks & crevices. • Discard vacuum bag and/or contents securely & immediately! • Cover fish tanks & remove pets from inside while treatments are being conducted. • Remove all children’s toys & any clothing from the floor. Access to all exposed carpet will allow for a more thorough treatment. • Please ensure a quality Flea treatment and bath wash is regularly available for your pet at all times. Bitcoin, Credit Card and Cash Accepted. Once All Precautions Have Been Administered And The Problem Persist Slug A Bug Pest Solutions Strongly Recommend Seeking A Professional Opinion Immediately. Our Highly Trained And Certified Technicians Can Provide A Solution That Would Best Suits Your Property And Your Budget.